Sweat drips down my face. We stand in a parking lot in Culver City, and it’s so hot we can feel the asphalt through our shoes. In a few days this lot will fade back into the featureless sprawl of Los Angeles, but for now this slab of tarmac is home to a charming little tent city that comprises the IndieCade festival. Independent games, both digital and tabletop, are on display here, but it’s actually a piece of hardware that has the longest line. It obstructs the walkway, curling back beyond the confines of a blue tent, hiding the line’s real length. Oculus has a large presence at IndieCade, and for good reason—the still-a-prototype headset has become a beacon of innovation on both the hardware and software fronts. The first game I’m hooked into is called Dumpy: Going Elephants—an acid trip of a game where you play as an elephant. When you swing your head back and forth in real life, your in-game elephant trunk also swings around, smashing UFOs and police cars to pieces and generally causing mayhem. It’s crazy. It’s fun. It’s exciting. So we pulled aside Nate Mitchell, Oculus’s VP of Product, to do a “brief” interview with us, discussing everything from “how to make your character seem like he’s more than four feet tall” to '90s virtual reality, architectural pre-vis, and oversized gerbil balls. Nate Mitchell, Oculus VR's VP of Product, speaking onstage at GDC Europe. The recorder comes out, the (digital) tape starts rolling, and we kick it off with the most obvious question—the one that has plagued us (and them) for months now. When are we going to see a launch date for the consumer version? Nate Mitchell: No release date has been announced. Do you have a launch lineup? Are you that involved with the community or is it just hardware and developers? NM: We would love to have a launch lineup, but we haven’t announced anything. NM: Yeah. Every studio in the world probably has dev kits, so we’re constantly working with all sorts of devs on experimentation or pet projects or integrations or indie projects. We just launched Oculus Share, which is basically a developer portal where devs can upload games, tech demos, experiments—like, stairs are something that’s really hard in VR. People have built little demos like, “Here’s a staircase,” so you can experiment really quickly and you can move the staircase and stuff—whatever. How do you share that with the community, right? 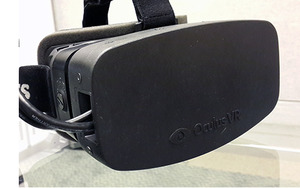 Oculus Share is a central repository of tech demos and support information for Rift developers. So we built this portal where devs can just upload things, share them and get feedback from other developers. If you want to learn about VR game design, you can go and download all these things and be like, “Oh, that looks like it has a cool UI,” and, “That looks like it has a cool camera implementation for VR,” and then learn from all those games. It was all about helping devs build better games, and there’s like 30 games on there now. Are they uploading just builds or are they uploading source code? NM: Mostly builds. Mostly not source code, so it’s a full executable that you can run. That’s a good question. We haven’t done anything like that, but maybe we should add a feature like that. And it’s just the hosting, because we also have our developer portal with source code and the integrations and documentation and samples and stuff. So they go like, half and half. First we launched the dev portal a long time ago when we launched the SDK. It’s kind of like an app store with no monetization aimed just at devs. Does that make sense? You can’t profit, but you can just share with other developers. I’m super-curious to see the depth and breadth of tutorials you have because I can only imagine developing games for this is completely uncharted. Is one of them how to make your guy not seem like he’s four feet tall? [Laughs] Yeah, that’s actually part of the talk. It’s some of the cool things like scale, player height, mass, all this neat stuff. Then some of the challenges are latency, simulator sickness, user interfaces—like, what is a UI in VR? If your main menu’s stuck to your face, it’s not immersive, it’s not fun, it’s not intuitive to use so you have to move the UI into the world to get this more immersive experience. Having a monitor stuck to your face presents some intriguing user interface design problems. 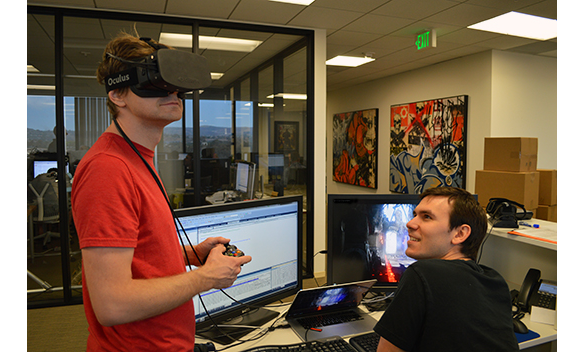 All this stuff is totally uncharted, so we’re trying to help developers build better games and really accelerate the VR game design research as fast as we can so we can get better games at launch that aren’t just Team Fortress 2. We want to see, like, “Call of Duty VR” that’s made for VR where you look down and launch a missile strike and then look up and look behind you and you’re peeking around corners—that’s when you start to push the medium forward and that’s when it gets the most exciting. Are you guys doing any work with voice recognition experts to enhance that side of things? Because obviously the fact that you can’t see the keyboard or controller is a big issue right now. Yes. So I can’t say exactly what we’re doing but what I can say is we want to nail the headset first. We want to get the visual aspect perfect. Controls are something that’s super interesting and challenging in VR. We don’t think a gamepad or a keyboard and mouse is the right answer, but god, voice recognition is complicated, so we’ll see. With the Rift it’s all about tricking your brain into thinking you’re somewhere else visually. We’re only using one sense. There’s no smell, there’s no audio—audio is coming from headphones or something else. But we really want to get vision to the point where it’s just perfect, and then we can move on to other areas. Humans are extremely visual creatures, so when you see something you will start to smell smells and things like that, or even like feel cold or hot depending on the location, but without the visual aspect your brain has trouble going the other direction. But with the Rift, the visual piece has always been the missing piece for VR. There hasn’t been something that visually feel like you’re somewhere entirely different. Once we nail that—getting back to the question—we’ll expand into other areas. Have you gone back and played old '90s VR cabinets? Oh yeah. Palmer (Luckey, co-founder of Oculus VR) has the biggest private collection in the world—that we know of—of VR headsets. He's got like, 57 units now, not including doubles and not including his own. I sort of made that number up, but he would tell you; it’s somewhere between 50 and 60. So yes. Dactyl Nightmare, some of the Virtual Boy stuff, he’s got all sorts of weird things. Actually the software tends to be harder to find than the actual hardware. Hardware is hard to find, but they pop up on eBay every now and again; it's harder to track down that weird game that was running on it at the time. Are any of those games good? Do you sit around and play them? They all have problems. The hardware just wasn’t ready. The latency was a challenge, optics were a challenge. So much of what the Rift uses is the same technology that’s in your mobile phone. The mobile phone explosion is really what makes the tech in the Rift possible. We’re standing on the shoulders of giants, basically. The technology is just getting to be there. When you go back and look at [old VR systems] and you’re like, “Oh, it’s so realistic but the graphics are 32-bit. Like, woah!”—It’s not their fault, it’s not like a failure. They did the best they could with the stuff they had at the time, but none of it’s very compelling. Are you in talks with Valve about getting an Oculus section on Steam? 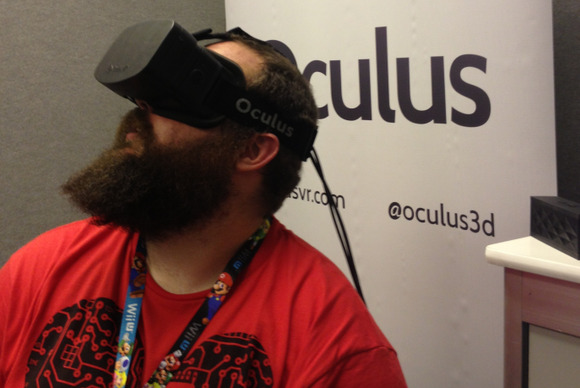 It’s specialized hardware, and a lot of those Oculus games are not going to work on a monitor. We’re good friends with the people at Valve. We’ll see; we haven’t really gotten that far. That’s something that would be more timed with our launch and less, like, today. Would Oculus games be sold on Steam or would they be sold through Oculus VR? No, they could be sold through both. I mean, one of the beauties of the PC is it’s an open platform. We want developers to get their games out however they want. We’re obviously going to offer as many great developer tools as we possibly can and hopefully the best connection to the Oculus audience—you know, like you put on your headset and you have an experience where you can buy games and connect with your friends and stuff like that. But if you want to buy your game on Steam and they sell it on Steam, there’s nothing stopping that from happening and it’s just as good. We want you using the Rift, more than anything.